Rarely do competitive racing chassis and engine and imaginative aerodynamic coachwork come together in the same car. 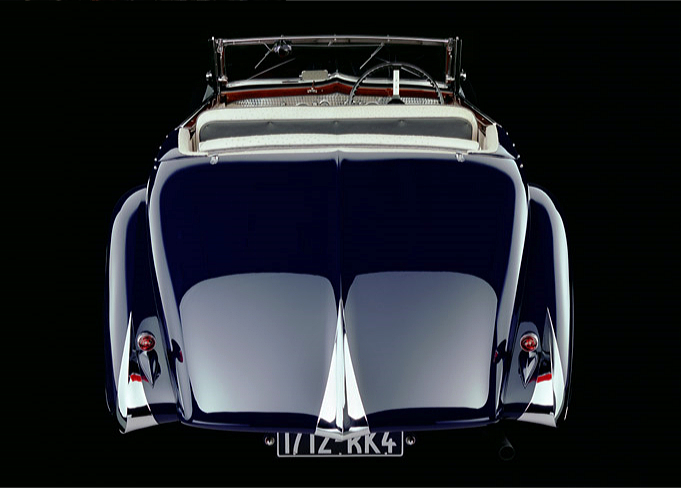 This was Figoni et Falaschi's signature style applied to a convertible... the new flowing streamlined coachwork for which Figoni-Falaschi would become internationally famous. 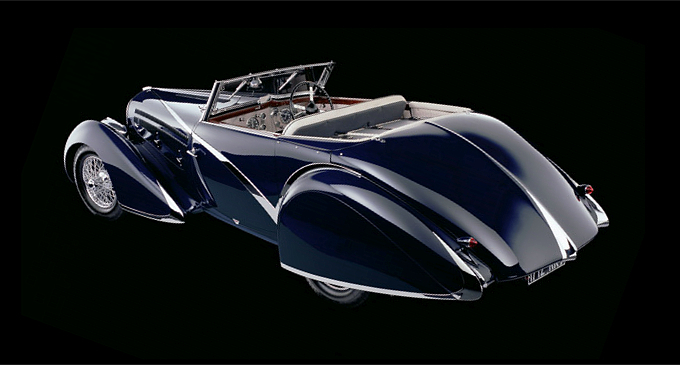 It most dramatically illustrates Figoni’s famed streamlined creations, in this case for a wealthy Parisian named Wolf, a personal friend of Figoni’s. 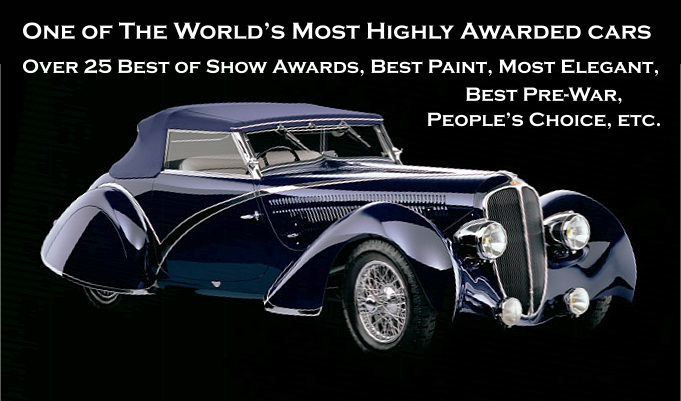 Wolf could afford the best of the best, so he challenged Delahaye and Figoni to create a car with elegant line, fine et elancée, with the fast and reliable Competition 3.5 liter six-cylinder engine, and the competition chassis... bearing in mind his intent to race the car and enter in rallies, as well as concours events and various showings for Figoni. 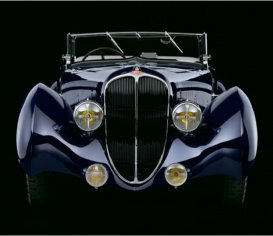 This design is a one-off, piece unique, combining the Delahaye identity in the grille and hood with generous teardrop fenders flanking Marchal headlights tucked tightly to the grille and a pair of Marchal fog lights fitted low below them. The fender shape is echoed at the rear with skirts enclosing the rear tires. Chrome accents highlight the fender trailing edges matching the chrome accent sweeping back from the peak of the grille, down across the doors then filling the rear fender joint and small chrome spline down the rear deck. Monsieur Wolf granted the privilege of showing his car to his close friend Figoni, for tours and other showings of the streamlined coachwork. Figoni himself drove this car, as Wolf’s eyesight was poor enough to limit his driving. Later, Wolf hired the famous French racing team of Guy Mairesse and Paul Vallée to campaign the car in various racing events. We have a photo of the team piloting the car in the Rallye de Monte Carlo in 1949, kindly supplied by Claude Figoni, Joseph’s son. The car achieved sixth place out of a field of 230 cars, in an extremely difficult and dangerous race on the rutted muddy wreck-strewn roads of postwar Europe. 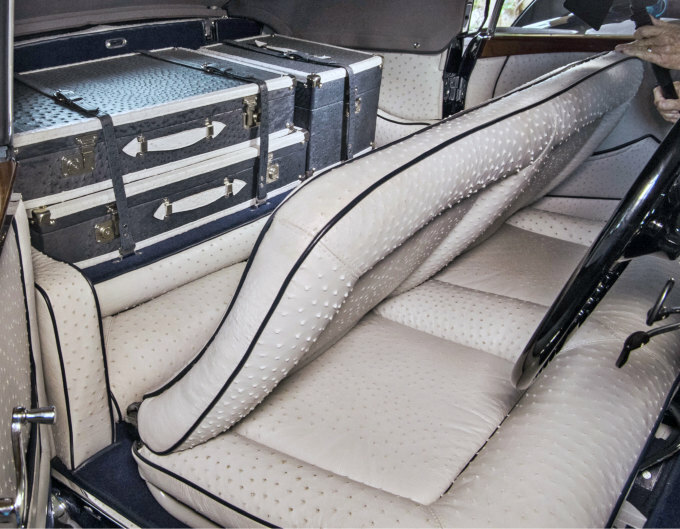 You'll appreciate the gorgeous interior's sparkling jewel-like engine-turned dashboard, soft and supple light gray (gris) quill ostrich leather seats and door panels, piped in dark blue leather. The light-colored upholstery is a perfect complement for the stunning Bleu Foncé exterior. Carpets are dark blue as is the soft top and trunk lining. 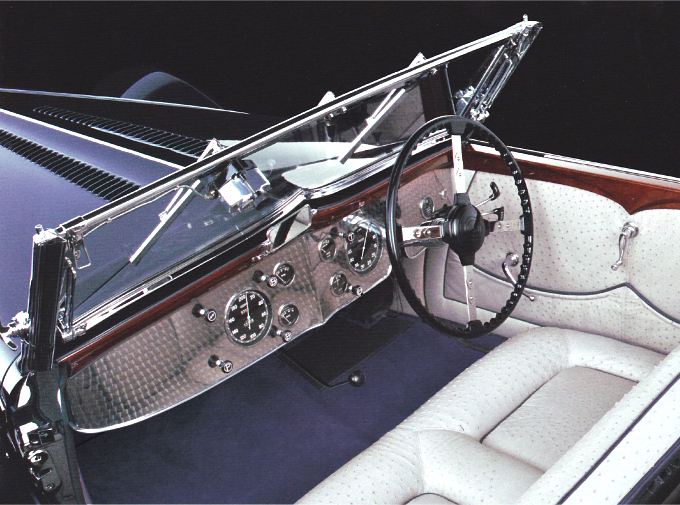 There are so many small touches that make this car unique -- like the upswept curve at the center base of the folding windshield, a theme picked up on the polished wood door panels, and on the upholstery. And, the car also has a set of matching fitted luggage as per the original build sheet. The luggage is finished in reverse colors of dark blue (bleu foncé) quill ostrich with gray (gris) edging and handles. The entire ensemble of internationally competitive wind-cheating luxury coachwork is simply breathtaking. 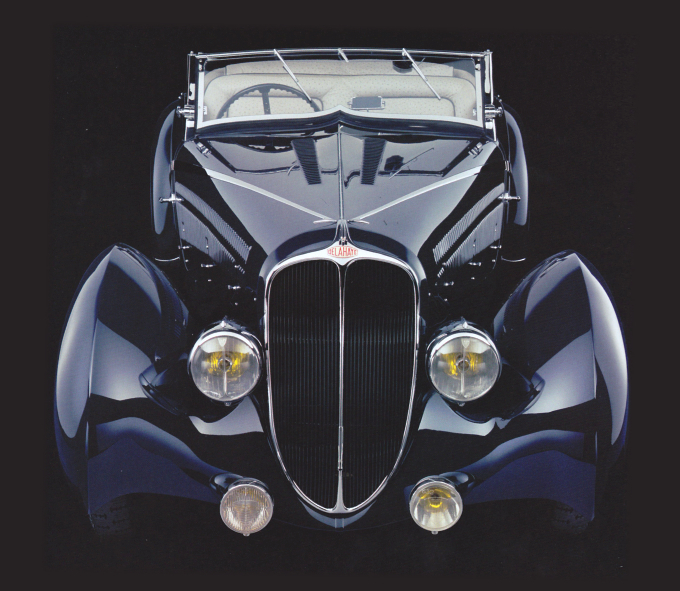 Refined detailed elegance and streamlined design combine masterfully with competition engine and chassis in this piece unique objet d’art, considered to be one of Joseph Figoni’s finest creations. Show, tour or simply stare at her; a visual feast. To be savored.